The story began in 1953 when entrepreneurs, Geoffrey Peter Whitworth and Ronald Francis Oxley set up a plant hire company and named it Neagron Construction Ltd. The name Neagron evolved from an anagram of the names of Ron, and Geoff’s wife, Jean, who worked as their secretary. They started the company with no assets other than an office at Abbey House, in the Victoria area of London. All plant was initially cross-hired and the first piece of equipment they actually owned, was a manual bar bender. From this one piece of plant the company grew. The owners soon realised the maintenance implications of their expansion and in 1957, employed Bill Rayment and later Bill Moore to provide a service arm to Neagron, and again using an anagram Raymoore Engineering Ltd was born. Raymoore’s became a bespoke engineering company that specialised in all engineering fabrication, servicing, repairs and testing. Neagron Construction Ltd was to eventually become a main agent for Wylie Safe Load Indicators, Priestman and NCK Cranes. They also thrived as a plant hire company supplying such equipment as road rollers, dump trucks, cement mixers, hoists, trench sheets, grabs, bar benders, workshop heaters and other construction plant equipment. The first cranes on the fleet were a Neals NM purchased for £800 and then a Coles Mk7 Truck Mounted Crane bought for £1850. Both cranes earned their keep and in 1963 the company invested in their first crawler crane, an NCK 205. The full integration of the two companies into Neagron Raymoore Cranes Ltd. was seen as a natural combination of expertise and soon began to develop the crawler crane hire and sales side of the operation, hence the gradual wind down of the general plant side of the operation. 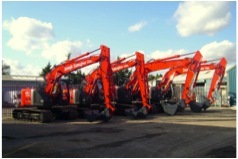 Priestman and NCK cranes eventually ceased production, but NRC’s increased specialisation in crawler cranes was soon noticed by Japanese manufacturers of heavy plant and in 1989, they became the sole main agent in the UK and Ireland for Sumitomo Cranes. The company name was changed in 1992 to NRC Plant Ltd. and under this banner, continued to develop their activities to become one of the best known companies supplying cranes for hire and sales. The company later moved from the suburbs of East London to larger premises in the Essex countryside between Orsett and Stanford-Le-Hope. In 1997 the company was purchased by Joseph Gallagher Ltd (Civil Engineers & Tunnelling Specialists).